Well…I told you a bit ago that on a Saturday Neighbor Girl and I ran to Decorah to do errands….We didn’t have a lot of errands. It was suppose to be Ridiculous Days (or sidewalk sales). 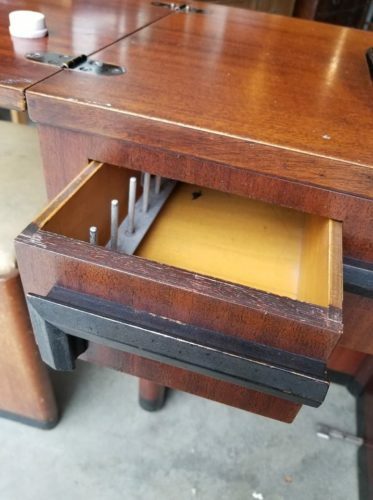 Quite often on those days there are lots of garage sales…and garage sales means I might find some vintage things for our booth in Harmony. Sadly there weren’t a lot of garage sales so we hit the thrift stores. We stopped at the first one and then onto the next one. There was a sewing machine in a cabinet with a chair that went with it. The cabinet had a price of $15. 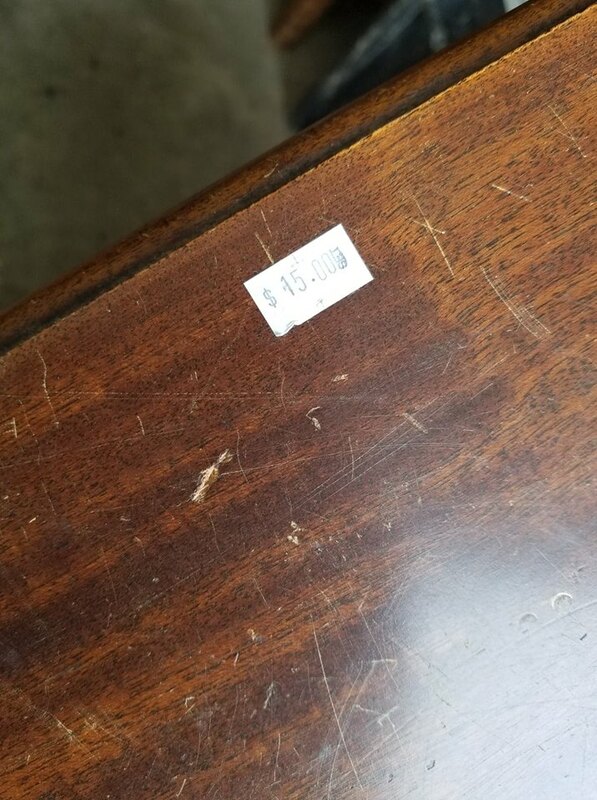 The chair had a price of $15. I was a little confused by that. I ended up checking…there was a Singer in the cabinet. 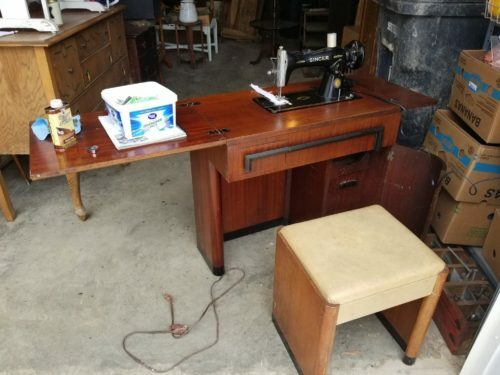 I admittedly know little to nothing about sewing machines and which model it might be or what’s more desirable. I just knew I was a little interested. I did look at the machine enough to see that it wasn’t beat up. The wheel did turn. That’s all I knew. 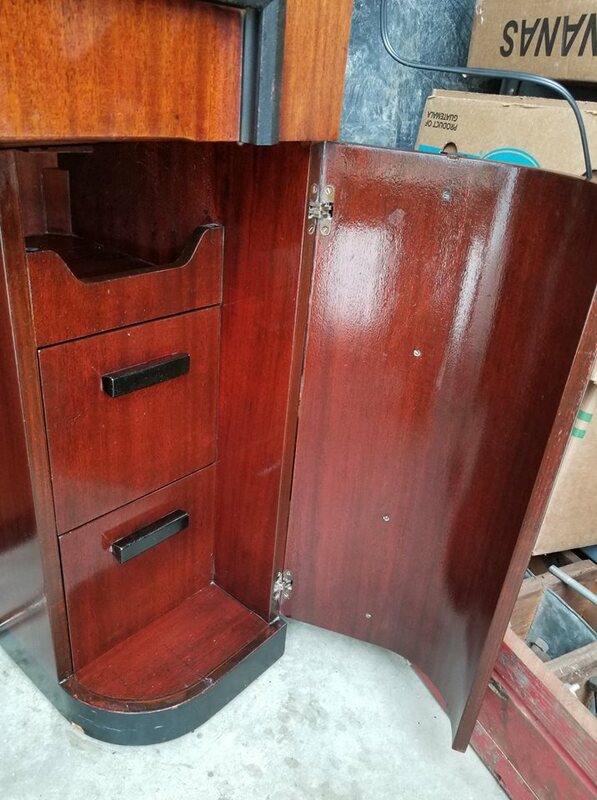 I ended up going up to the counter and I asked….”Is it $15 for the machine in the cabinet AND $15 for the matching chair? or Is it $15 for the whole grouping?” The clerk didn’t know. She said she’d have to talk to Julie, the girl in the back. Well as I was driving home I started thinking about how I’d fix it up and where I could resell it. Selling a machine in a cabinet is harder than selling just a machine. Then I started wondering about what kind of machine it was. In the quick glance I had of it, I knew it wasn’t a 301…that’s about all I knew. Once home, I opened her up….I started cleaning. Oh the scratches and dings. It was worse than I thought it was. I had already cleaning and restored the top when I took this picture. I snapped a picture of the serial number and went to look her up. Hmm. I couldn’t find the number. I messaged Connie. She knows way more about machines than I do….then she said, “Look it has a Centennial badge”. DUH. Of course it was a Centennial. Then Connie asked for a picture of the machine….she thought it was a 99K. Is she right? I looked a minute and am wondering if it’s a 15-91. HELP?? …and note the top decal. Under Singer Manufacturing it says “Made in Canada”. Do all machines say that? Oh she was beat up. The entire machine had looked like the photo below. 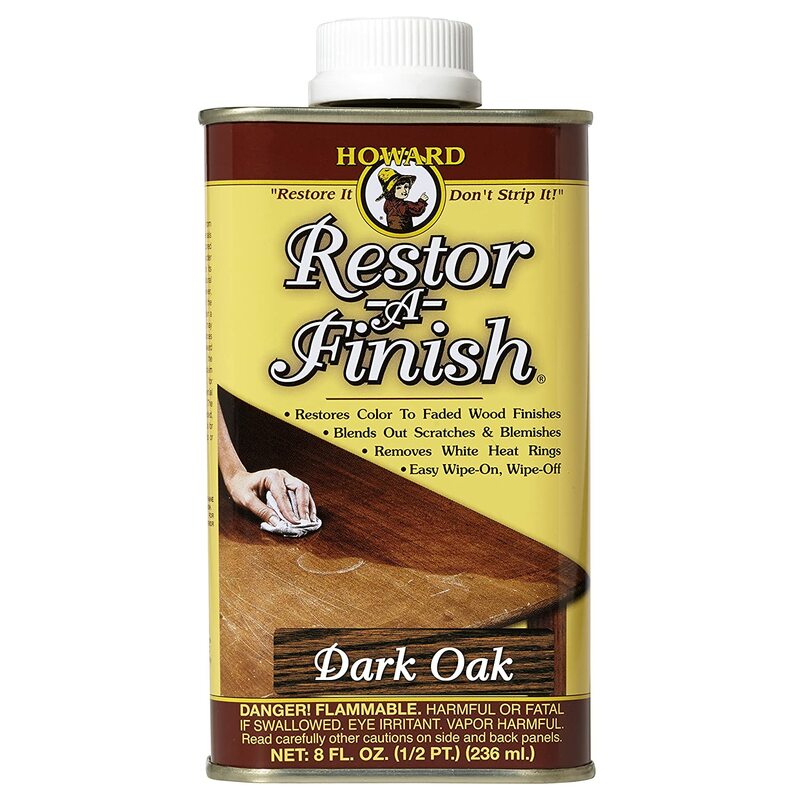 I kept working with the Restor-a-Finish. WOW…It was doing wonders!! Just look at the dings and scratches that it is hiding. About then is when I quit shining her up. I wasn’t done. I was starting to really like the cabinet. 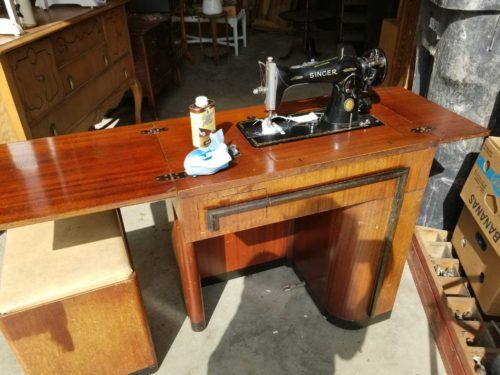 I’ve learned that my shoulder does a little better when I’m sewing if I sew at a cabinet….Gee. I love the cabinet and how it’s looking. I wondered if the machine works. Be still my heart. It chugged…it chugged again. UGH. That was a waste. 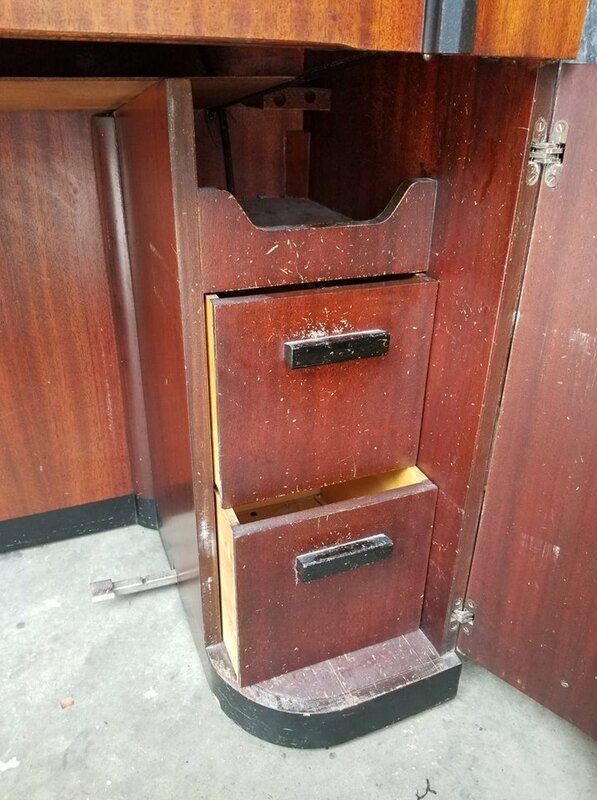 I have a nice cabinet and a crappy machine. I just blew $15. No one will want a cabinet only. I played with the wheel a bit and then, just like that, off she went. The machine works like a charm. 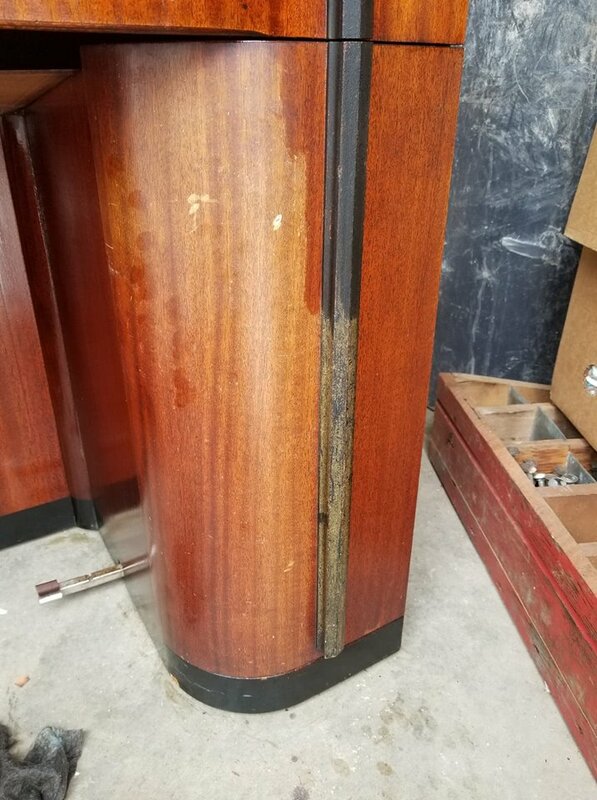 I think it was just stuck from sitting unused. I love the stitching…WOW. What a deal and all for $15. 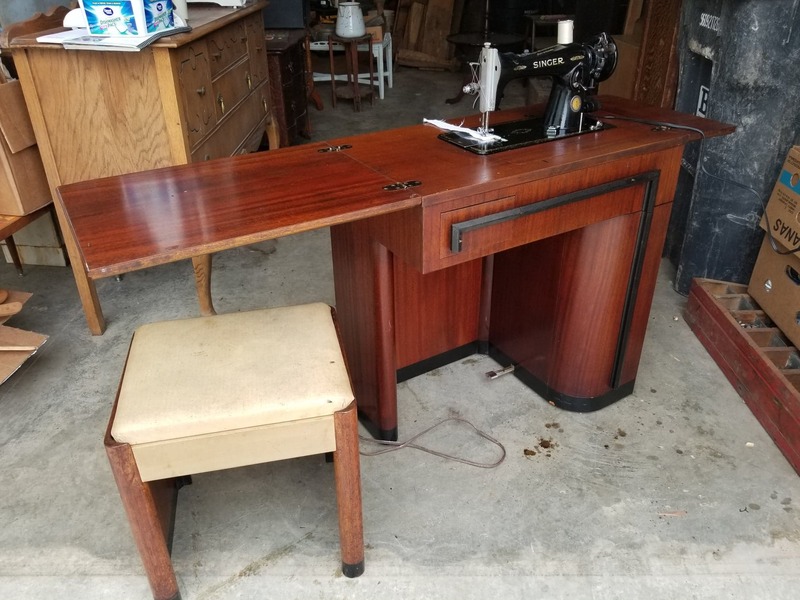 It wasn’t a crappy machine at all…..WOW!! I’m getting to where I have a nice machine AND a nice cabinet. DEAL!!! Now, where can I sell it? I went back to polishing her up….Gee…I wonder how much I could resell this for. What kind of asking price do I put on it…. Hmmm. I better think on that… I better consult Connie and the internet. I continued polishing then stopped. I needed to snap a picture so I could show you all the difference Restor-a-finish makes. If this picture doesn’t make a person believe in Restor-a-Finish, I don’t know what will. Can you see the bright look to the right and the yuck to the left. Look at the difference in the black trim piece. WOW. This is what the product we used looks like. 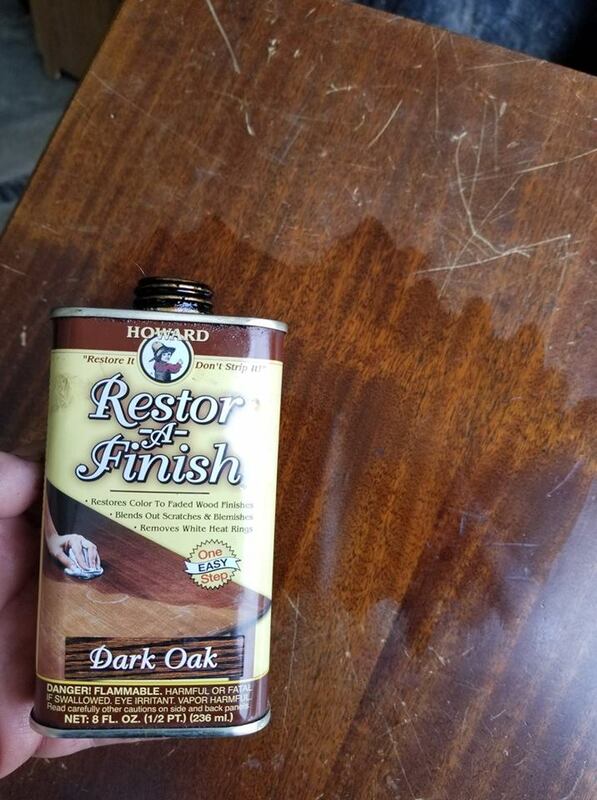 There are other stain colors you can can get this in. We have dark oak and light oak. Those two colors cover most of our needs. 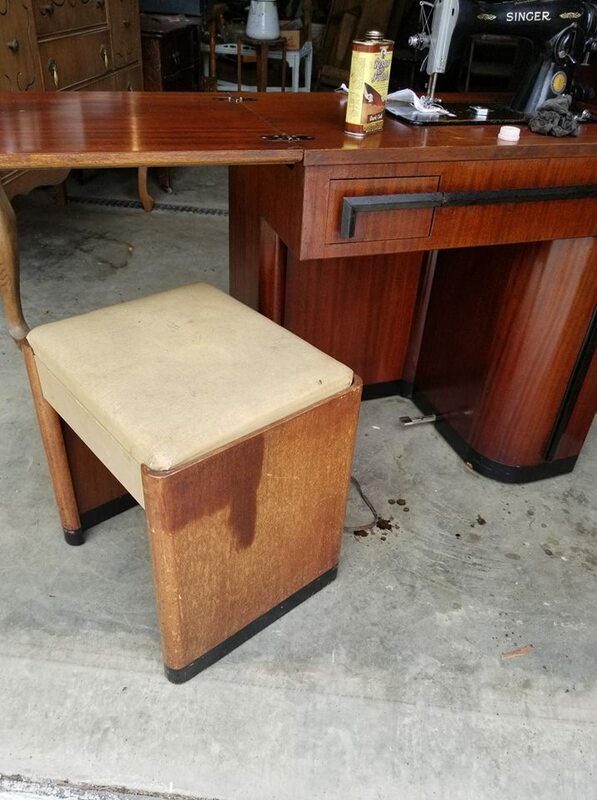 I got done polishing the cabinet and then started in on the chair…. Wow that’s looking good. Who would have thought it could look so nice? Right about then I decided I didn’t care about decluttering and minimalizing. I had decided a price….NOT FOR SALE! I’m keeping her. To heck with the “happiness is less philosophy”. I’m keeping her….and best yet…I’m going to use her regularly. She deserves to live another day…and being it was me that put the work into her…I deserve to get to keep her. Besides….This way I can see that her story will have a happy ending. Doesn’t she look sharp? Oh my I love her. So then I went in to tell Hubby…. He was so sweet. He said he couldn’t see why I wouldn’t keep her. 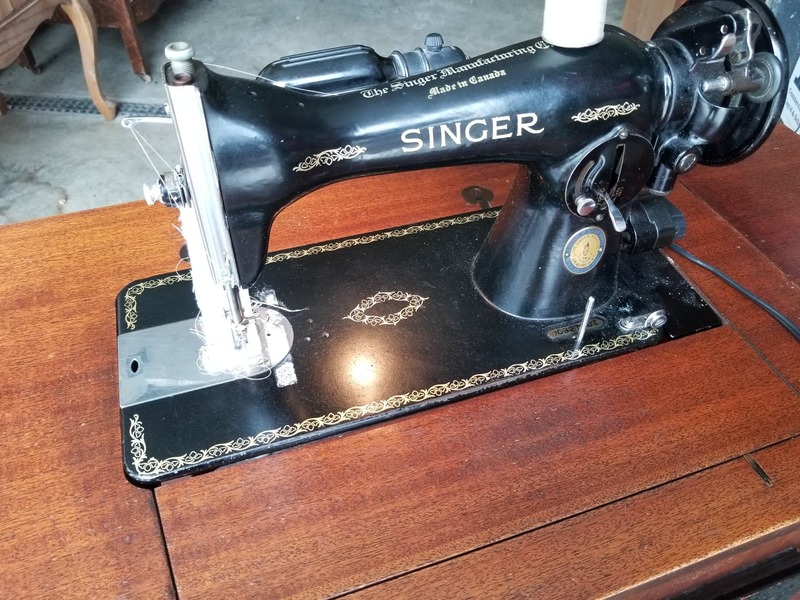 So blog readers…meet Julie…named after the lady in the back of the thrift store who made my day by saying $15 for it all. So…now Julie is going upstairs to live out her life…well actually my life. I’m hoping someone will love her after I’m gone….and now, I really need to be done purchasing machines….at least ones that I keep. So blog readers. 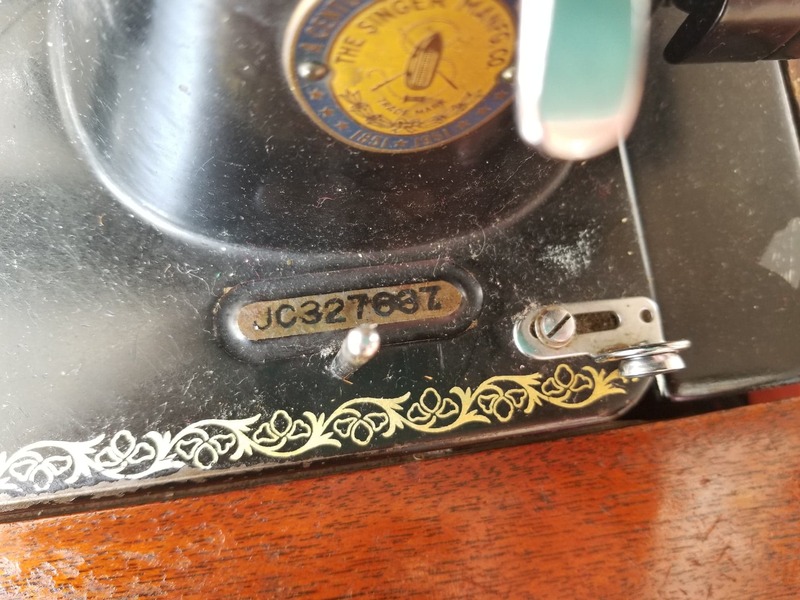 If any of you knows anything about my machine or the cabinet please pass on the info.